As the summer winds down and we find ourselves at the Equinox, my thoughts turn to the winter ahead. The past three winters we have spent here in Thunder Bay have certainly been different than we expected. After what seemed to us to have been a continuing stream of mild winters, we moved here to encounter three very long, very cold winters in a row. 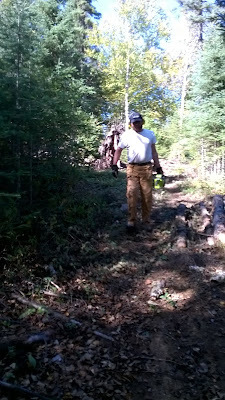 It was a real struggle to keep up with our firewood needs, and each year I have hoped that we'd have more of a margin ahead of the curve than we seem to wind up with. This year, again, I am hoping that with further improving the airtight features of the cabin we can help to retain more of our heat. Of course, I don't want to rely on that, so I plan on filling all the woodsheds again. Currently we have been burning up loads of slabs that filled our original woodshed. They burn up fast and not nearly as hot as I would have expected. They have been good for the sauna, but I don't know if they would be nearly as fun to try to use in the cabin on a regular basis. They are a valuable and bountiful resource at the moment, but I also want to be able to throw on the occasional log to see if I can keep a fire overnight. In any case, in the bush there were some definite dead but standing trees that I had noted already last fall and winter, so I was quite ready to begin bringing them in for this year's burning. 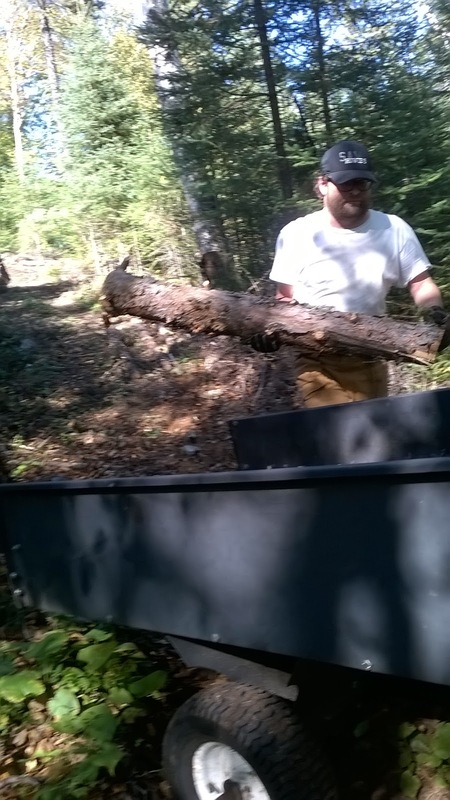 The first one I dropped and dragged in went well, but with no snow on the ground, dragging the bare log through the bush ensured much soil ground into the bark. This dulled my chainsaw blade extremely rapidly, and got me rethinking a log arch. For the next one, I decided that it wouldn't be too bad to cut it up into four or five foot lengths and simply load them into my trailer. This went much better, and part way through the exercise, Donna and Kenny showed up to bring me some refreshing water, and to photograph the endeavour. 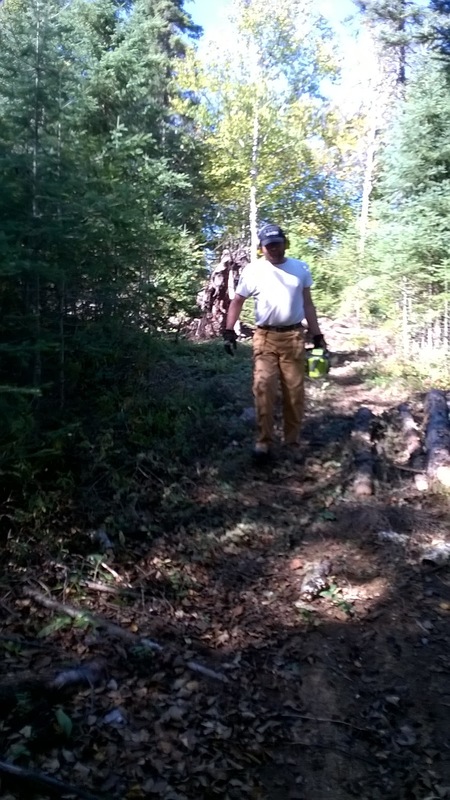 Nice day to take your chainsaw for a walk! At this point I had cut up a fair bit of wood back at the cabin and both my chainsaw batteries were run down, so I brought back the wood and switched over to doing more interior work at the cabin. No, it wasn't a used iPhone or something like that. It was literally a crabapple that we invested over $175.00 in growing. As you remember, we planted two apple trees about four months ago. One of them produced a lovely little crabapple, and with Aunt A! visiting us last weekend, we decided to finally taste the fruit of our labours. To my mind, it was delicious. Very tart! I'm looking forward to more in the future to help amortize the initial costing better. As part of the repercussions of moving the washing machine from the sauna to the cabin, we no longer are as encouraged to hang the laundry at the sauna to dry. It is, and will continue to be, far more convenient to be able to deal with the damp clothes close to where they are washed. Up until now, we have been hanging the clothes on a twenty five foot line I had strung up under the porch of the cabin. It ran along the west side, but even so, it was under the porch roof, and didn't receive much sunlight or breeze. It also ran past our living room window and so our view was often blocked by the sight of my tidy whities enhancing our supper meal. 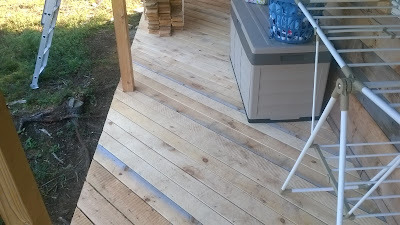 This past weekend I obtained the last few rough cut boards to complete the porch floor completely around the cabin. This opened up that side for better access, and as such I mounted a new drying line to see how well it fit in with our lifestyle. So nice to have these last boards down! Normally it would be a no-brainer to put up a standard two reel line heading out to a far off, tall tree. In our case though, I couldn't come up with a very acceptable way of mounting the line so that it didn't interfere with our ability to fully enjoy the porch. 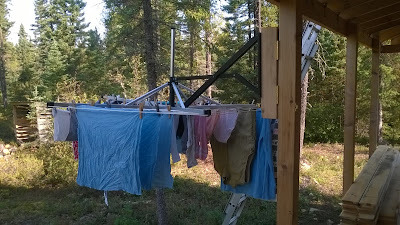 With the initial setup, we still had a clothesline that was hanging down at face height all along that back edge, and I didn't like the effect it was having on our feng shui. 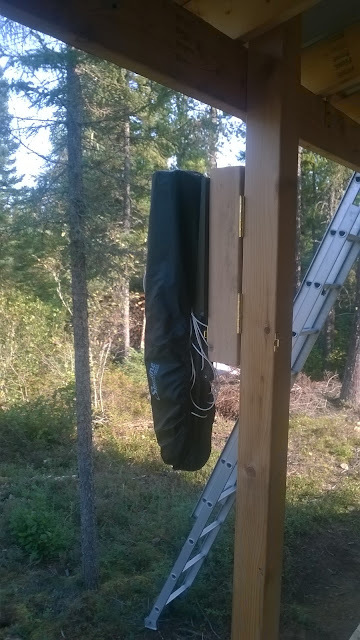 So, this time I put up a wall mounted umbrella type drying on one of the support posts. 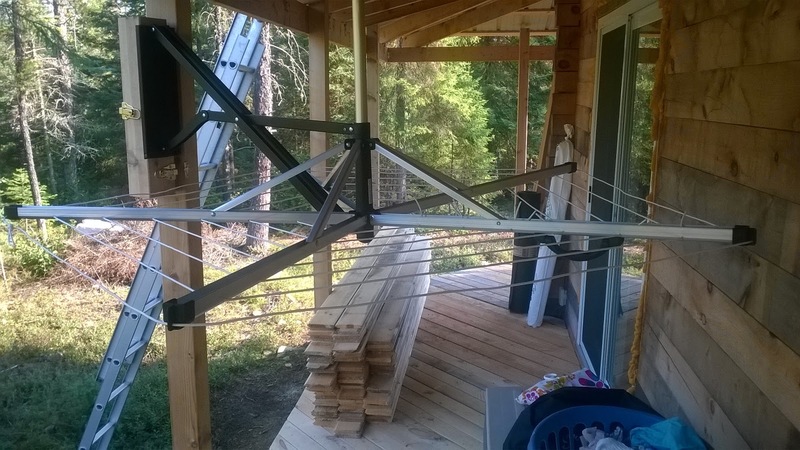 The caveat was that if I mounted it out from under the porch, we wouldn't be able to reach it to hang the clothes. 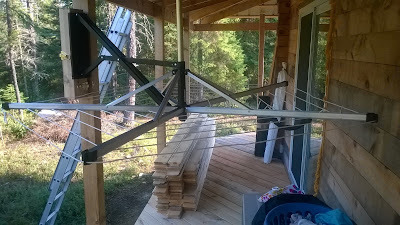 If I mounted it under the porch, we couldn't take advantage of the increased sun and breeze that clothes could get from being mounted away from the cabin. 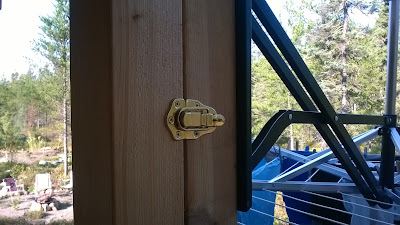 There was also the added disadvantage that a mount under the porch would again disturb our ability to access that space. It even has a nice cover when it folds up. Lots of space when opened. The hinges let me swing it in and out with ease. 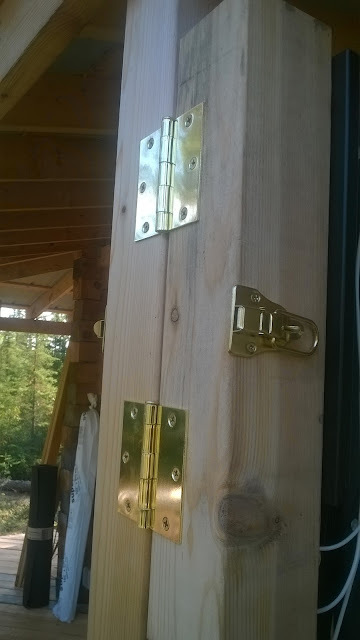 Two sets of latches ensured that the dryer would stay either in our out, in spite of breezes. So far it has performed quite well and holds a very surprising amount of laundry. The latch keeps it from swinging about. For bedsheets and really heavy mats, we will likely continue to use the large, standard line out at the sauna or the folding stand we have used in the past. But for our day to day laundry, I'm eager to see how the new mount works out. Well, I have been big on making sure we don't have too many unitaskers in our lives. The rice cooker, in spite of its' name, surely isn't one of these! I have prepared a number of interesting meals in it. Recently, we were out of bread and so Kenny and I decided to see if it was up to this task. The recipe we used was based in basic bread, but we also decided to go off script and make a few of our own changes. I'll also give my suggestions for how I would modify it in future. First up, wash hands thoroughly, no cooties in our kitchen! Then, a nice apron to help keep us clean as we work with sticky, greasy and dusty ingredients. Our kit all laid out nice and neat. Including the rice cooker bowl, which doubled (tripled?) as the mixing bowl, rising bowl and baking dish. First we add in the flour. It was a half pint/250mL jar overflowing until there was no more chance of even a single grain of flour to be added. Next time I should use a 500mL about 3/4 full I think. I added a bunch of Brule Creek flour to the mix, which is pretty heavy. The balance was straight up all purpose flour. Next add about 2/3 of a 250mL jar of my homemade hard cider. Whatever is left in your bottle is the head baker's prerogative to drink. A teaspoon of kosher salt. It can be any salt I guess, I just found the kosher salt first. How about a splash of milk? I had a 125mL jar that I only filled up about a quarter full. Sugar. We used brown. I think maybe another heaping tablespoon. Yeast. I used instant yeast, about a tablespoon or heaping tablespoon. Next time I would probably proof it in a bit of warm water first to give it a big head start. This time I was lazy. I bet quick yeast would also be super-effective. Now mix. Kenny really kneaded it well, but it was still shaggy and sticky. I added about four or five more tablespoons of all purpose flour until it became more "loaf"y. Cover with a damp cloth and allow it to rise. In the old days I would have put it in the oven with the oven light on for warmth. This particular day was sunny so I sat it outside to see if it could rise much. After the first hour, not much had happened, but I flipped it over and set it back outside. After the second hour I flipped it again, and put it in the rice cooker with a prayer. Not much rising had happened - curse that delicious but heavy flour and my impatience with the yeast... Turn on the rice cooker and hit up an hour on your timer. After hour the first, flip it again, and go for another hour. After the second hour, flip again and go for another hour. Okay, we're five hours in... But at least it's pretty easy to deal with. Flipping once an hour only takes a second. Enjoy with a big glass of milk and some cinnamon cream cheese!